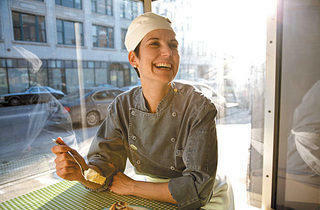 A fine-dining pastry chef shows Chicagoans Hoosier Mama. All Paula Haney wanted was to go out on a Saturday night for a good slice of pie. But there was a problem: She and her husband, Craig Siegelin, couldn’t find any. Your average pie lover could have let this go and accepted some second-rate slice, but the determined Haney just isn’t the type of person to settle. This hankering for decent pie emerged almost a decade ago, when Haney was working 16-hour days devising high-concept desserts as the pastry chef at Trio, first alongside Shawn McClain and then with Grant Achatz as he prepared the groundwork for Alinea. Collaborating with McClain and Achatz sparked Haney’s imagination, but the constantly changing menu exacted intimidating demands. “[Achatz and McClain] would come up with a dish, and we would all taste it, and the first second was like, ‘Oh, that’s so great,’ and the second second was like, ‘Oh my God, what am I going to do to follow that?’?” Haney recalls. Burnt out from her Achatz-inspired high jinks during six years at Trio, Haney returned to the first thing she’d ever made and the dessert she had been searching for: pie. “All along,” Haney says, “I really just wanted a pie shop.” So she and Siegelin sat down and made a list of all the characteristics of bad pie—a soggy bottom crust was high up there—crafted recipes that avoided those pitfalls, and dove in headfirst. Three years ago, Haney started making fresh fruit and other varieties out of Kitchen Chicago, a shared cooking space in Ravenswood Manor, and selling the pies to shops like Dollop Coffee Co (4181 N Clarendon Ave, 773-755-1955) and Noble Tree Coffee (2444 N Clark St, 773-248-1500), as well as from a weekly Green City Market stand. On Saturday 14 (3/14, “pi” day, get it? 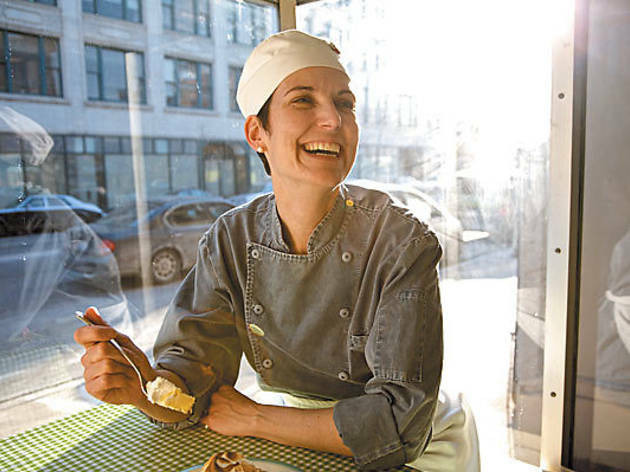 ), she’ll open up the tiny, 750-square-foot West Town storefront she’s been using for the past few months as her kitchen to the public, selling whole and by-the-slice pies in varieties like apple, banana cream, chocolate chess and other fruits like strawberry-rhubarb in season. In addition to her sweet pies, she’ll offer savory ones, like a recent pork-apple-sage double-crust combination Haney developed to showcase the meat from a hog farmer she befriended at the market, as well as Metropolis coffee and perhaps muffins, scones and down the line, a cake of the day. There’s only space for a few tables in the front of the former FanSiPan space, painted a celadon green reminiscent of a ’40s diner, but come summer there’ll be sidewalk seating and a back porch for devouring that simple yet unparalleled combination of a cup of coffee and a slice of pie. For Haney, though, the transition from fine dining to old-fashioned pie making doesn’t seem quite so stark. Beating pie dough with a rolling pin like a baseball player smacking his bat against the dirt, Haney’s movements are precise but elusive. After speedily rolling out and trimming the thin, pliable dough, Haney rests it on top of a pie tin. Her hands circle the crust, quickly folding the excess dough underneath itself, pressing it tightly but gently into the pan, pinching the edges bit by bit into small, even ridges. Across from her, Anne Marion, Haney’s sole employee for the slower winter stretch, peels an enormous number of Granny Smiths using what Haney calls her most high-tech piece of equipment: an antique-looking apple-peeling crank. Hoosier Mama Pie Company (1618½ W Chicago Ave). Mon, Wed–Fri 8am–7pm, Sat 9am–5pm, closed Tue and Sun.